Anticuchos de PolloThis marinade produces some seriously tender and delicious chicken. In Peru this seasoning is traditional for making grilled beef heart (regular anticuchos). It's wonderful for steaks too. Serve anticuchos de pollo with rice and grilled corn. This dish is made with aji panca, a mild red chile pepper with a smoky flavor common in Peruvian cooking. You can often find dried aji panca or jarred aji panca paste in specialty stores or Latin food markets. Mash the garlic with a rock, or with a mortar and pestle. Add a little water if necessary to make a paste. Make the marinade: in a bowl, mix the crushed garlic, 1/4 cup of the vinegar, 1/4 cup chile pepper paste, 1 tablespoon cumin, 1 tablespoon salt, and 2 teaspoons freshly ground pepper. Cut the chicken breasts into 1 inch by 2 inch cubes. Place chicken pieces in bowl with the marinade and stir well. Marinate chicken at least one hour, or overnight in the refrigerator for best flavor. Peel the onion and cut into 1 inch wedges.Remove the seeds and the white part of the bell pepper, and cut into 1 inch chunks. Place the chicken and vegetable pieces on the wooden skewers, alternating the chicken with the vegetables..
Make a basting mixture of 1/2 cup vegetable oil, 1/4 cup vinegar, and a pinch of cumin. Prepare the grill, and grill chicken for 5 minutes on each side. Baste chicken several times during cooking. Cut a piece of the chicken to check for doneness. If the chicken is still pink on the inside, place it back on the grill, checking frequently. Do not overcook. Remove the chicken from the grill. Serve with rice and corn on the cob. Papa rellena is a delicious comfort food, similar to mashed potato pancakes, but with a surprise ground beef center. In fact, this is an excellent recipe for using up leftover mashed potatoes. 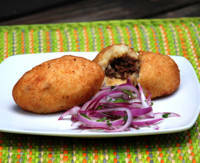 To make papas rellenas, you first prepare some seasoned ground beef filling, similar to an empanada filling. Then you mold some mashed potatoes around a center of ground beef, and you form the whole thing into an oblong shape - basically you make it look like a potato! Then you fry it in oil until it's golden brown and crispy. Kids love this meal, especially with ketchup. Place the raisins in a small bowl and pour 1 cup boiling water over them. Let them soak for 10 minutes. Bring a large pot of salted water to a boil. Peel the potatoes and place them in the pot. Cook the potatoes until they are tender when pierced with a fork. While the potatoes are cooking, cook the onions, garlic, and peppers in the vegetable oil until soft and fragrant. Add the cumin and paprika and cook 2 minutes more, stirring. Add the ground beef and cook until browned. Drain the raisins and add them to the ground beef. Add the beef broth and simmer for 10 to 15 minutes more, until most of the liquid is gone. Season mixture with salt and pepper to taste. Remove from heat and let cool. When the potatoes are cooked, drain them in a colander. Mash the potatoes thoroughly, or pass them through a potato ricer. Season the mashed potatoes with salt and pepper to taste. Chill the potatoes for several hours, or overnight. Once the potatoes are very cold, stir the egg into the mashed potatoes until well mixed. Shape the papas rellenas: with floured hands, place about 1/4 cup of mashed potatoes in one hand, and make a well in the center. Fill the well with 1-2 tablespoons of the beef mixture. Mold the potatoes around the beef, adding more potatoes if necessary, and shape the whole thing into an oblong potato shape, with slightly pointy ends, about the size of a medium potato. Repeat with the rest of the mashed potatoes. Coat each stuffed "potato" with flour. In a deep skillet or deep fat fryer, heat 2 inches of oil to 360 degrees. Fry the potatoes in batches until they are golden brown. Drain them on a plate lined with paper towels. Keep the potatoes warm in a 200 degree oven until ready to serve. A classic Peruvian dish with a fun presentation, arroz tapado is a great choice for company, and kids love to help make it. It’s a South American version of sloppy joes that will please the pickiest eaters. Use a small bowl for individual servings, or mold it with a large bowl and let everyone dig in. In a saucepan on medium heat, sauté the minced garlic in the vegetable oil until the garlic is golden and fragrant. Add the water, salt, and rice and bring to a boil. Lower the heat, cover, and simmer for 10 minutes, then stir in the frozen peas. Simmer for 5 minutes more, covered, until the water is absorbed. Turn off the heat and leave the rice covered until you are ready to use it. In a skillet on medium heat, sauté the chopped onion in the olive oil until soft and golden. Add the ground beef and cumin and cook, stirring, until the meat is browned. Add the tomatoes, chile pepper, and raisins and cook on medium-low heat, stirring occasionally, until most of the liquid is evaporated. Add the chicken broth and simmer 5 to 10 minutes more, until the liquid has cooked down, but before it becomes dry. Remove from heat and season with salt and pepper to taste. Grease a small glass bowl with butter. Fill the bowl 1/3 full with some of the rice. Add a layer of the ground beef filling, then cover the filling with more rice. Press rice firmly into the mold. Turn the bowl onto a serving platter or individual plate, and remove the bowl. Garnish with sprigs of parsley, black olive halves, or strips of red pepper. A dessert whose name means "the sigh of a woman (from Lima)," must be something special. Suspiro de limeña is a classic Peruvian recipe, quite unusual and delicious. The bottom layer is made of (Dulce de Leche known as manjar blanco in Peru) that has been enriched with egg yolks. The top is a sweet, stiff meringue made with port wine. The combination is rich, sweet, creamy and might just make you sigh with contentment. Homemade dulce de leche is wonderful, but if you are short on time you can easily substitute purchased dulce de leche. Prepare the dulce de leche (recipe here), or heat purchased dulce de leche in a saucepan just to boiling (while stirring constantly to prevent sticking and burning). Remove from heat and whisk in the 4 egg yolks, one at a time, until well mixed. Stir in a teaspoon of vanilla and pinch of salt to taste. Let mixture cool slightly, then pour into serving pieces while still warm. 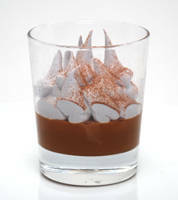 Divide dulce de leche into 6 to 8 individual glasses or cups, or one larger dish. Bring port, sugar, and a pinch of salt to boil in a saucepan. Add the egg whites to the (very clean) bowl of a standing mixer. When the temperature of the port/sugar mixture reaches about 240 degrees Fahrenheit (115 degrees Celsius), or after about 3 minutes, turn on the mixer and start beating the egg whites. When the temperature reaches 248 degrees Fahrenheit (120 degrees Celsius), remove the syrup from the heat. The total cooking time is about 4 minutes, and the sugar syrup should make thin threads if you drizzle it off of a fork, and will have thickened slightly. The egg whites should be forming stiff peaks. Slowly and carefully pour the syrup down the side of the mixer bowl, into the beaten egg whites while beating. Continue to beat the meringue until it cools, about 5 minutes. Using a pastry bag with a round or star tip (or a ziplock bag with one corner cut off), pipe the meringue decoratively on top of the dulce de leche. (You may end up with extra meringue). Chile suspiro until ready to serve. Sprinkle meringue with cinnamon and serve chilled or at room temperature.